Marjorie Trumaine, a freelance indexer from rural North Dakota in the 1960s, risks her life to help local law enforcement track down a missing, disabled girl. Dickinson, North Dakota, 1965. It's a harsh winter, and freelance indexer Marjorie Trumaine struggles to complete a lengthy index while mourning the recent loss of her husband, Hank. The bleakness of the weather seems to compound her grief, and then she gets more bad news: a neighbor's fourteen-year-old disabled daughter, Tina Rinkerman, has disappeared. Marjorie joins Sheriff Guy Reinhardt in the search for the missing girl, and their investigation quickly leads to the shocking discovery of a murdered man near the Rinkermans' house. What had he been doing there? Who would have wanted him dead? And, above all, is his murder connected to Tina's disappearance? Their pursuit of answers will take Marjorie all the way to the Grafton State School, some six hours away, where Tina lived until recently. And the information she uncovers there raises still more questions. Will the murderer come after Marjorie now that she knows a long-hidden secret? Larry D. Sweazy is the author of Where I Can See You, See Also Deception, See Also Murder, A Thousand Falling Crows, Escape from Hangtown, Vengeance at Sundown, The Gila Wars, The Coyote Tracker, The Devil's Bones, The Cougar's Prey, The Badger's Revenge, The Scorpion Trail, and The Rattlesnake Season. He won the WWA Spur award for Best Short Fiction in 2005 and for Best Paperback Original in 2013, and the 2011 and 2012 Will Rogers Medallion Award for Western Fiction for the Josiah Wolfe series. He was nominated for a Derringer award in 2007, and was a finalist in the Best Books of Indiana literary competition in 2010, and won in 2011 for The Scorpion Trail. He has published over sixty nonfiction articles and short stories, which have appeared in Ellery Queen's Mystery Magazine; The Adventure of the Missing Detective: And 25 of the Year's Finest Crime and Mystery Stories! ; Boys' Life; Hardboiled; Amazon Shorts, and several other publications and anthologies. He is member of ITW (International Thriller Writers), WWA (Western Writers of America), and WF (Western Fictioneers). "Brimming with atmosphere and filled with well-drawn characters, See Also Deception is bound to delight mystery readers everywhere. Marjorie Trumaine rings as solid and true as any heroine ever created." "Welcome to Dickinson, North Dakota, 1964--a place so real you can smell the rakfisk cooking.... Bookish farmwoman Marjorie Trumaine is the ideal amateur sleuth--steely, steady, and in tune with the subtle rhythms of small-town life. Sweazy's perfect pacing, spine-tingling tension, and living, breathing characters make See Also Deception one of the best mystery novels I've read in a long time. You're going to love this book." "Sweazy's lean writing style and consummate storytelling skills will sweep you up and dump you onto the harsh prairies of North Dakota. The mouth-dropping ending will have you marking the days till Marjorie Trumaine's next case." 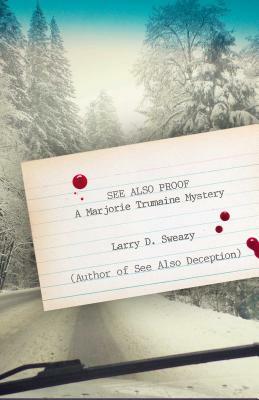 "The riveting See Also Deception rewrites the rules for small-town mysteries, adding a retro element that evokes times long before cell phones and the Internet. But Larry D. Sweazy's formidably stalwart heroine, Marjorie Trumaine, is still more than up to the task of peeling away layers of secrets and subterfuge in getting to the bottom of a local librarian's death. This is deceptively dark mystery writing par excellence, a potboiler of a tale that proves an able mix of Peyton Place and Agatha Christie." "A dark, complex mystery with well-developed characters deeply rooted in their small-town rural setting. Larry D. Sweazy gives mystery readers a rich, satisfying read."